In memory of my Riley Girl, Pooh Dog & Keemo! Sure miss them! Just this side of Heaven is a place called Rainbow Bridge. There are meadows and hills for all our special friends to run and play. Plenty of food, water, warmth and sunshine. The animals are happy and content, except for one small thing, they miss someone very special who they left behind. A day comes when suddenly they stop and look into the distance with big Bright Eyes, they begin to run through the tall green grass, their legs carrying them faster and faster. You, my friend, have been spotted. You meet, cling together in joyous reunion, happy licks and kisses adorn your face never to be parted again! You have arrived at Rainbow Bridge!! We at Helen Woodward understand that your feelings when a pet dies are real and deserve the same respect as if it where any other family member. Wendy Khentigan, M.D. is a psychiatrist with a general adult and adolescent practice in Encinitas.She is an animal lover and long time supporter of the Helen Woodward Animal Center. 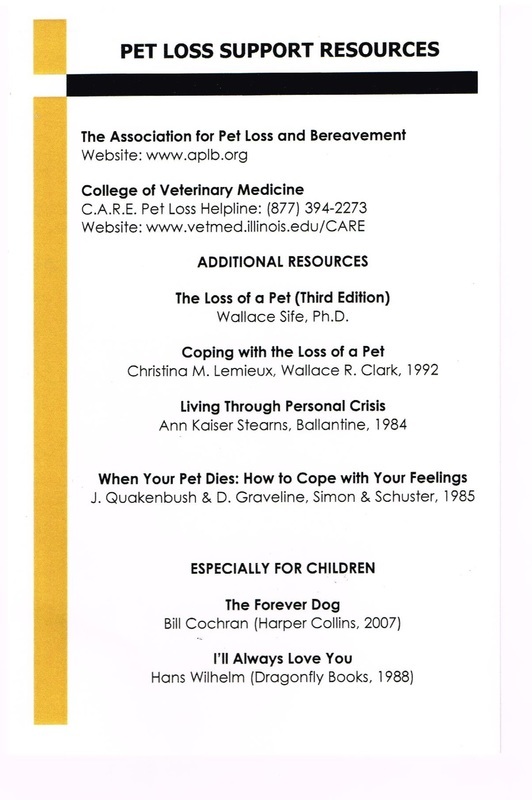 Wendy provides some tips on coping with that grief, and with the difficult decisions one faces upon the loss of a pet.